Cleaner air courtesy of an air purifier for dust, mold, and allergens. The filter-free design has a ceramic core that sterilizes air at over 400 degrees and then circulates freshly cleansed air back out into your space—and it does so silently, thanks to no moving parts or fans. 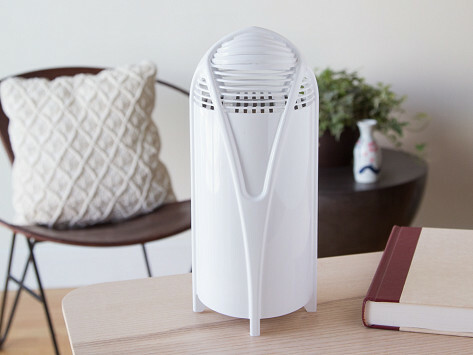 Dimensions: 5.1" x 5.1" x 11.8"
Airfree is an air purifier for mold, dust mites, and other allergens that works stealthily to clean the air in your space. Because there are no moving parts or fans, the purifier is completely silent. And it’s close-to-effortless to operate, too—simply turn it on and leave it on for consistently cleaner air. A ceramic core is the source of the cleansing magic. It continually draws in air through convection and sterilizes it with heat that’s over 400 degrees. The heat kills irritants and allergens in the air like pet dander, bacteria, viruses, and pollens. The freshly cleaned air is cooled super-fast—in just seconds—and sent back out into the room. There are no filters to change and different purifiers to suit the size of your space. It’s a low-energy, but high-powered alternative to getting cleaner air.